So, just as we're all getting used to the idea that Intel's Haswell was going to be the only one to really make any waves in the graphics market any time soon, Nvidia came and released the new GTX 700 series of graphics cards. Chances are though that you've already heard a fair amount about the new top-end card. The rumours of a GTX Titan LE turned out to be true, but it has now been branded as the top SKU in the new GTX 700 series, the GTX 780, which we'll be reviewing soon on TechRadar. Realistically though, the Titan LE name is actually far more of an accurate description of this new top-end graphics card. 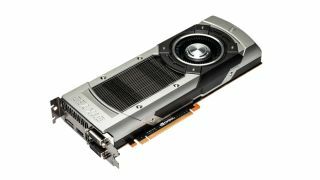 There is surprisingly very little actual difference between this card and the £800- £900 GTX Titan, and according to Nvidia's Ben Berraondo the performance ought to be a bit of a shock too. "You'll be surprised just how close you get to something like Titan," he says. "And just how much lower-priced it is as well. I think it's for everyone who loved Titan but couldn't stump up to an £800 graphics card." So what is it? Well, it is just a slightly cut down GTX Titan, with the same GK 110 GPU with just around 300 fewer CUDA cores. But with some 2,304 of the little unified shaders to call its own, that's not going to really hobble the GTX 780 too much. It is also running with less VRAM too, with 'just' 3GB GDDR5, but is still making use of the same 384-bit memory bus. The GPU is, however, running slightly faster than the standard GTX Titan, with a slightly higher base clock straight out of the box. Before you pro-graphics folk get all excited about the prospect of a very serious professional card filtering down for half the price of a GTX Titan, it's worth pointing out that Nvidia has taken the decision to disable double precision for the GTX 780. That's a bit of a shame, but perfectly understandable given a large percentage of the GTX Titan sales were probably people looking for a cheaper Tesla card. But from the sounds of it that has been a marketing decision rather than an engineering one, so we wouldn't be surprised if some enterprising tweaker manages to find a way to unlock the double precision performance of the GTX 780's GK110 GPU. Despite the fact the entire GTX 700 series is going to based around the same existing architecture as the GTX 600 series, Nvidia is keen to point out that this is a 'proper generation', so we'll see an entire line-up of cards being released before the end of the summer. To that end we've also got a GTX 770 and GTX 760 on their way too. Nvidia wouldn't be drawn on just how far down the stack it's going to go - after all we've got the Haswell parts potentially making things more uncomfortable for the lower-end discrete cards. While it was keeping any juicy details of the GTX 760 close to its chest - as arguably the most interesting card presumably being in the volume segment - Nvidia was keen to talk about the GTX 770. With the GTX Titan's GPU making its way into the top card of this new generation, it has chosen to shift down the same version of the GK104 GPU from the GTX 680 into the second tier GTX 770. Essentially, we're going to see performance which actually ought to exceed the GTX 680 from this new card. Despite reports to the contrary this isn't simply a rebadged GTX 680, though it is mighty close. "We have learnt from bad examples in the past," says Berraondo. "So the obvious one is the 9800GTX+ to GTS 250 - none of these are direct rebrands of what's come before."